PRODUCT DESCRIPTION: These two wall sconce style fly traps are the PL Luralite Cento and the Professional. Basically they're very similar except for size. These traps use light to attract nuisance flying pests like filth flies. Once around the light bulb, they will get stuck on the glue pad located inside the trap and hidden from view. 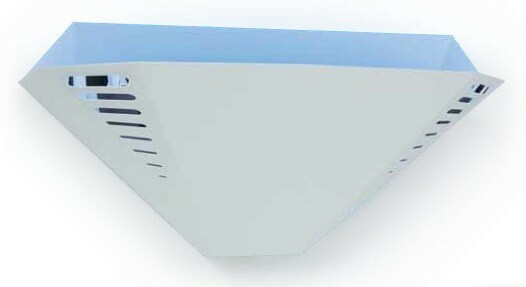 This trap is a classic wall mount which is both discreet and attractive. These traps are excellent for dining rooms, foyers and other areas where flies are a nuisance and the trap used must blend in with the surroundings. It will serve you by providing dim atmosphere light as well as be a very effective tool for controlling annoying flying pests. The Cento is the smaller of the two measuring 7.75 inches tall, 17.5 inches wide and 7 inches deep. The glue pad is one board which fits into the front panel opposite the 18 watt light bulb. The Professional is slightly larger measuring 7.5 inches tall, 28.5 inches wide and 8.25 inches deep. It too has a single glue pad which fits in the front panel opposite the 30 watt light bulb. WHERE TO USE: These traps are for areas where people will be present and discretion is advised. Dining rooms, kitchens, foyers and hallways are typically where this design works well. RATE OF APPLICATION: The smaller Cento will cover approximately 270 sq/ft and the larger Professional model will cover 540 sq/ft.